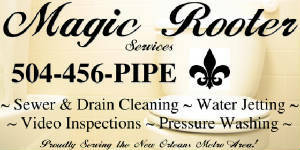 New Orleans Premier Sewer & Drain Cleaning Service Company. Residential - The unclogging of Kitchen Sink, Washing Machine, Face Basin, Bathtubs, Shower, Toilet and Sewer lines. Outside Sub-Surface drain lines including pool and yard drains. 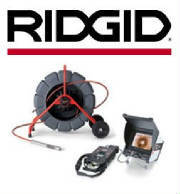 Restaurants / Bars - Kitchen floor drains, Grease Trap drain lines, Bathroom and Sewer lines. Also clean all Sub-Surface and Parking lot drains. 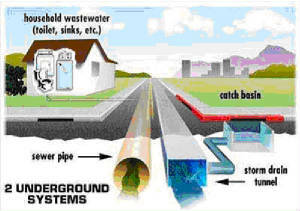 Strip Malls / Apartment - Condo Buildings - Building main Sewer lines, Grease Trap drain lines to individual unit stoppages. Sub-surface and Parking lot drains. Parking lot, Pool drains and most other drain lines. A Video Inspection is an inspection of drain lines to see the condition of piping. Also see if any problems exists. 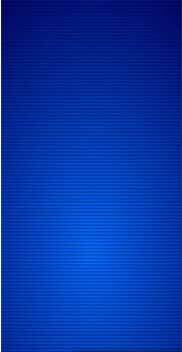 Can locate all lines and will tell how deep lines are. Diagrams - a drawing of where drain lines are, also shows where problems, if any exist. This is a must for buying or selling a home. "I'll Be At Your Door Before It Hits The Floor"